This Project is open to the Aged and Families who want travel and visit tour sites in Ghana. In a brief description, Ghana, is a nation on West Africa’s Gulf of Guinea known for diverse wildlife, old forts and private beaches. Coastal towns such as Elmina and Cape Coast has colonial buildings and castles-turned-museums that serve as testimonials to the slave trade. North of Cape Coast, vast Kakum National Park which has a treetop-canopy walkway over the rainforests. However we offer you the best of your vacation trip coupled with HCDP GHANA Class Standard Certificate as you enjoy your tour around the country Ghana. Traveling through Ghana is fairly easy, due to the numerous taxis and “trotros” (mini buses or small trucks). The governmental STC buses are rather comfortable and connect the big cities and that makes it very easy to move from one place to the other. 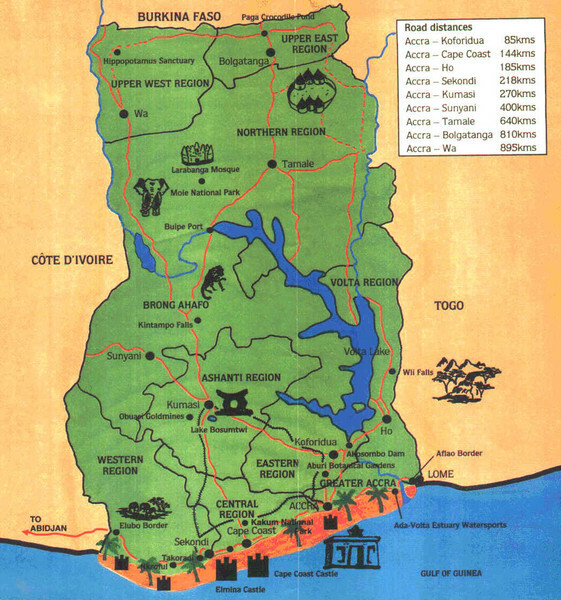 The region is the smallest of all the regions and a gateway to Ghana. The city of Accra has been the economic and commercial capital since 1877. The city also offers a wide range of entertainment with a variety of African and international restaurants, night clubs, and bars. The region has a dense population and is the traditional home of the Gadangbe tribe. The foods in Ghana are mostly “soups”, which are really sauces or stews, made of groundnuts, tomatoes, onions, egg-plants, and fish or meat. They are eaten with fufu (mashed cassava, plantain or yam), kenkey or banku (sour fermented corn wrapped in plantain leaves). The main fruits are: pineapple, papaya, banana and orange.